Traction is generally meant to pull on a part of human body by applying continuous force, using weights and pulleys for stretching the arms, legs, neck, back or pelvis for a proper alignment of bones and decompression of joints. Cervical Traction is a non-surgical treatment for relief in neck pain and associated problems. The patient wears a head halter with weights for maintaining a proper alignment to put back the herniated disc in the neck in a normal position. GPC Medical Limited, the most trusted Indian manufacturers & exporters of a variety of hospital equipment & devices, produce high quality Rehabilitation Aids including an exclusive range of Cervical Traction Kits & spares thereof. 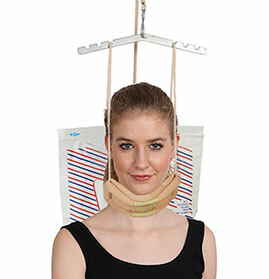 The latest machinery enables our dedicated and highly experienced professionals, using supreme quality raw material, to produce Cervical Traction-Kits and Spares in accordance with the internationally accepted quality standards. Tested rigorously, our products are dimensionally accurate, finely finished, reliable, easy to use and suitable for use at hospital and home. They have a long functional life. They can be used conveniently for vertical as well as horizontal traction. They are in a big and regular demand internationally. 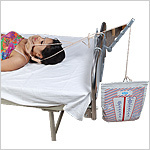 Send Your Buy Requirement For "Cervical Traction Kit & Spares" AND Get Quote Quickly.